IRCI organised ‘Asia-Pacific Regional Workshop on Intangible Cultural Heritage and Natural Disasters’ from 7 to 9 December 2018 at Sendai International Center and in Onagawa Town, Miyagi Prefecture, Japan. The workshop was co-organised by Tokyo National Research Institute for Cultural Properties, and in cooperation with the Center for Northeast Asian Studies, Tohoku University. 17 participants from Asia-Pacific countries such as Myanmar, Viet Nam, Philippines, Nepal, Fiji, Vanuatu, Bangladesh, Indonesia, and Japan presented various case studies and issues on the safeguarding of intangible cultural heritage (ICH) in disasters. In addition, UNESCO Category 2 Centre in Peru (CRESPIAL) also reported on ICH and disasters in Latin America and the Caribbean. In total, more than 40 researchers and specialists on ICH and disaster risk management attended the workshop for active discussions, including the UNESCO Beijing Office, UNESCO Category 2 Centres in China (CRIHAP) and the Republic of Korea (ICHCAP). On Day 1, Asia-Pacific participants shared case studies and challenges concerning ICH and disasters in three sessions of (1) Natural hazards/disasters and the transmission of ICH, (2) Challenges and lessons learnt from disaster experiences, and the potentials of local knowledge, and (3) Enhancing dialogue between ICH and disaster risk management. 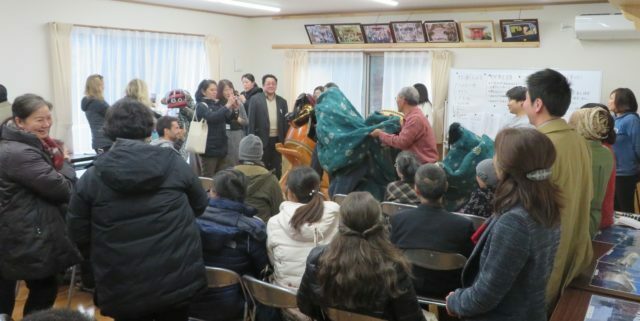 An excursion was arranged on Day 2 to learn about the revitalisation of shishihuri folk performance in Takenoura Community, Onagawa Town, after the Great East Japan earthquake and tsunami in 2011, through the lectures and performance. It also provided a valuable opportunity to directly communicate with the community people. A session to introduce efforts of post-disaster revitalization of ICH in Japan, and a report on ICH and natural hazards/disasters in Latin America were programmed on Day 3, and the final discussion involved the comments by two resource persons and the detailed examination of the draft Recommendations for safeguarding ICH in disasters and mobilizing ICH for DRM, which was adopted at the end of the workshop. The proceedings of this workshop will be published in March 2019.